Despite its dramatic and sombre history, Berlin is arguably one of the finest cities in Europe for families to explore, offering kids on holiday a multitude of activities and attractions, from the world's largest inner-city park to LEGOLAND and everything in between. Active families will enjoy heading out to areas like Grosse Muggelsee for a spot of swimming, boating or hiking. Wannsee is great for escaping to the outdoors for a break from traditional sightseeing and the chance to blow off some steam. Animal and nature lovers will go wild for the Berlin Zoo-Aquarium which has an incredible collection of animals and many fun activities, and the Berlin Botanical Gardens, which offer plenty of space for children to run around. The many impressive squares of the city also provide areas for amusement and lots to keep young minds busy and happy. 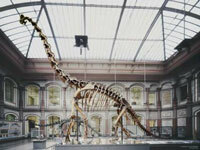 When the weather turns bad and kids' activities out of doors are few and far between, head to one of Berlin's indoor playgrounds or one of the many museums the city has to offer, such as the Nature Museum (Museum fuer Naturkunde), which will take up most of the day with hundreds of exhibitions. Museums such as the Pergamon will also delight children.